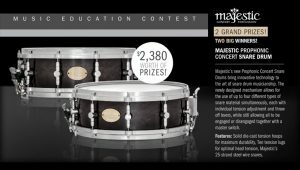 Enter the Music Education Contest from Cascio and Majestic! Majestic’s new Prophonic Concert Snare Drums bring innovative technology to the art of snare drum musicianship. The newly designed mechanism allows for the use of up to four different types of snare material simultaneously, each with individual tension adjustment and throw off levers, while still allowing all to be engaged or disengaged together with a master switch. Features: Solid die-cast tension hoops for maximum durability, Ten tension lugs for optimal head tension, Majestic’s 25-strand steel wire snares. Contest Expires August 31, 2017. All entries must be submitted online by August 31, 2017. No purchase necessary. Void where prohibited. All decisions by Cascio Interstate Music are final. Contestants must be 13 years of age or older to participate. Employees of Cascio Interstate Music, participating sponsors, their affiliates, subsidiaries, advertising and promotion agencies and their immediate family members and / or those living in the same household of each are not eligible. Prizes will be shipped unless otherwise specified. Prizes that are to be picked up will be available at our local retail location located at 13819 W. National Ave., New Berlin, WI. Special arrangements may possibly be made to pick up prizes. Call 262-789-7600 to contact our retail location with any questions. Cascio Interstate Music is not responsible for lost, late or misdirected prizes sent by mail or by shipping companies. Cascio Interstate Music will not send prizes to P.O. boxes. No substitutions or transfer of prizes is permitted. All federal, state and local taxes are the sole responsibility of the winner. One winner per family and household. Cascio Interstate Music is not responsible for lost, late, unreadable, stolen or misdirected entries. Cascio Interstate Music reserves the right to substitute a prize of equal or greater value for all contests and giveaways. Ties will be decided by a drawing process. One entry per person, per household. Cascio Interstate Music reserves the right to change, alter or modify these rules at any time with or without written notice. These are general contest rules and individual contest rules may vary. Cascio Interstate Music reserves the right to end or stop any contest at any time for any reason.